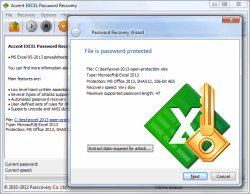 Accent EXCEL Password Recovery is the fast and easy way to restore lost passwords to files created in any version of Microsoft Excel. The program’s unique optimization for Intel and AMD processors guarantees top-speed password recovery. And there’s nothing to learn: the simple, functional AccentEPR interface does it all for you. The software evaluates your computer’s configuration and performance in order to select a recovery scenario that balances recovery time and the number of passwords covered. AccentEPR comes with a built-in macrolanguage that lets you create password mutation rules for dictionary attacks. With this flexible feature, you can change the spelling of a password, add words and symbols, combine passwords from multiple dictionaries, and more! This approach cracks passwords like "pa55word" or "VeryStrongPassword1234" much faster than other options. The highly optimized code in Accent EXCEL Password Recovery draws on the unique features and strengths specific to each Intel or AMD processor in order to fully leverage their potential and achieve top password recovery speeds. Put simply, program saves you significant time when recovering passwords. 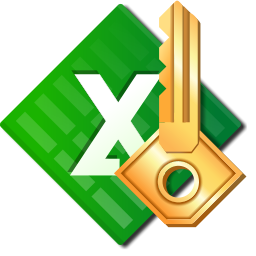 When you encounter the problem of a lost Microsoft Excel password, let AccentEPR fix it. You can be sure you’re using the best solution available. The program is a perfect solution to the problem of a lost Excel password. Yet we recommend using software that easily handles Microsoft Office 95 – 2013 and OpenOffice documents and also features GPU computing with AMD and NVIDIA graphic cards. Delete passwords to open Microsoft Excel files with AccessBack.com. AccessBack.com is an online service offering guaranteed removal of passwords from any files created in Microsoft Excel 97-2003 (files ending in .xls/.xla with 40-bit encryption). The service uses rainbow table technology to run through encryption keys at light speed, decrypt the document and remove the password. Results are guaranteed, regardless of how long or complex the original password. * While processing time depends on demand, we promise results in less than 24 hours from the time you upload your file.